Kay Hickman’s All About ME (Machine Embroidery) presentation for February was to add embroidery to a jacket made from a sweatshirt. The only time I had ever cut up a sweatshirt was to turn it into a dust rag. Now, I was cutting apart a brand new sweatshirt to use the fabric for a jacket, as shown in the featured book, Londa’s Way Book 2. I used my favorite jacket pattern because I knew just how to cut it for the fit I like. After that, I followed all of the easy directions offered in the All About ME webinar and in the book. The free embroidery design for the webinar is part of the “Bold and Beautiful” collection #80001 which also has a matching grouping of fabrics. 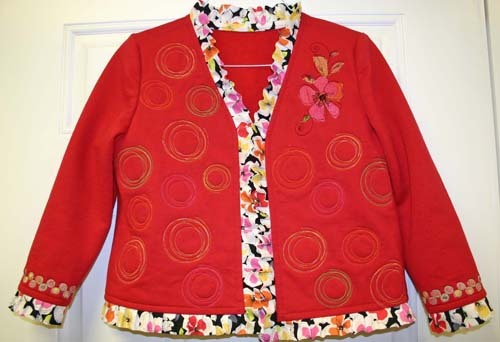 I used one of those fabrics for the ruffle, and used all of the colors found in the floral design when I sewed the circles on the front of the jacket. I applied stabilizer to the entire front section of the jacket, a technique I use often with the “My Label” patterns, which helped keep it from stretching, especially along the V-neckline. Ruffler #86 made trimming the jacket an easy step. Thanks to All About ME, my sweatshirts will never be the same again. Next Next post: Sewing Rocked at SXSW!